Bought a new brand of chilli bean sauce (or chilli oil bean paste as translated from Chinese), made in Sichuan. Very cheap and quite oily. The smell and flavour is much better than any brands I had used. I will from now on look out for this brand. A picture of this can be seen at the background in the picture below. Been wanting to make Chengdu chicken for ages finally got round to it. 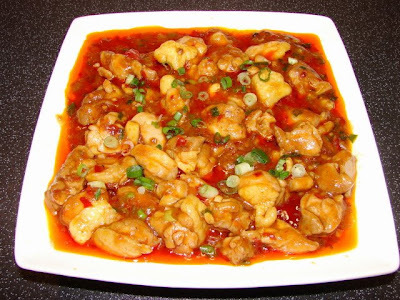 It's wow, pungent with several layers of spiciness which really hits the spot if you like spicy food. It's a bit oily because I use meat with skin on but the oil is really tasty and gives the dish a bright red colour. The mandarin peel gives a different dimension of flavour which was unusual and quite lovely. 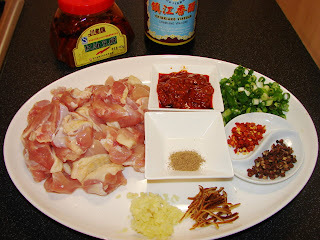 Heat oil in wok or large frying pan add the whole Sichuan peppercorns and brown them for few minutes to infuse the oil. Then remove and discard. Add chilli flakes and chicken stir till chicken is slightly brown. Add ginger, mandarin peel and chilli bean sauce. Stir fry for about 2 minutes, add wine and vinegar. Add enough sugar to taste. Add a splash of water (more or less to your taste, if you like the chicken dry add less). Then add slackened cornflour to thicken. Sprinkle with ground sichuan pepper then add spring onion.